Ball covers are a simple way to deter birds, reduce evaporation, control odors, and to retain heat in ponds and tanks. A ball cover is a simple and effective way to cover a pond. A ball cover is made up a large number of small black, UV-stable plastic balls. These balls are typically 4" (100mm) in diameter and completely sealed. This gives us a light weight ball that floats on top of a water containment typically covering 91% of the surface. 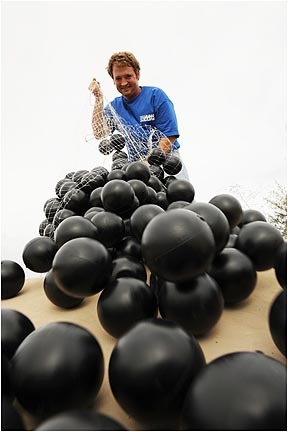 As water levels rise and fall the balls organize themselves into a cover that completely covers the surface. This masks the surface of the water from waterfowl preventing birds from landing in or near the water. This is one of the main uses for ball covers making them very popular for ponds near airports and for ponds that contain hazardous liquids.